After latest Gaza massacre, the EU must suspend its Association Agreement with Israel! At least 34 people killed and over 1600 wounded – this is the tragic outcome of a peaceful protest in Gaza to remember the Nakba, and to protest the inhumanity of the Israeli imposed siege. The “Great March for the Right to Return” was organised for the first time by civil society and political parties alike. The purpose of the march was to reaffirm the Palestinian refugees’ right to return to their lands and to demand the full implementation of the United Nations General Assembly Resolution 194 passed in December 1948. The world has allowed Gaza to become an open prison where, because of the siege, people die unnecessarily because they are refused access to medicines or specialist medical care. They do not have regular access to water and electricity. They are cut off from their families, from educational opportunities, and from employment outside of Gaza. The strict control of movement of goods and of energy makes working and living conditions almost impossible. It is an open prison because it is forbidden for any inhabitant of Gaza to leave for whatever purpose. As we have witnessed in recent days Gaza is also a place where you cannot even have a peaceful protest about these conditions. According to Israel’s defence minister, Avigdor Lieberman, “no one in Gaza is innocent”. They are all, even the children, ‘legitimate targets’ according to a spokesman for the Likud party. Even the journalists, nine of whom have been shot and one killed, even with their highly visible Press jackets, are legitimate targets. The human rights abuses suffered by the Palestinian people as a result of the illegal occupation intensifies with every passing day. The utter contempt for Palestinian lives, demonstrated during the recent military onslaughts on Gaza, has now been displayed once again. After years of imposed deprivation the situation in Gaza has been in free fall over the course of the last year. In 2012 a United Nations report estimated that by 2020, Gaza would become unlivable. The estimate has since been modified to 2018. This is the horrifying truth of Gaza, a place that most of the world, and certainly most of the world’s media, prefers to ignore. This truth may come back to haunt us all, because we all become brutalised by permitting it to happen, and allowing international law to be rendered meaningless. There are now two generations of children of Palestinian refugees, victims of the Nakba who were ethnically cleansed from their lands, who together with their parents are not permitted to leave this open prison. They have not forgotten, and they have taken on their parents’ struggle demonstrating that they have hope that one day the world will help them. Over the last decade Gaza has regularly featured in headlines as the target of three military onslaughts, an ongoing siege and a humanitarian disaster. No amount of reportage can capture the scream of an imprisoned people – generations of Palestinians – pleading for help, and insisting on their rights. Our children will surely ask us “how could you let this happen ?” It is to be hoped that a day will come when an Israeli child will also ask his dad “why did you shoot unarmed civilians ?”. None of us can say we did not know. Israel commits this atrocity, this war crime, in front of the eyes of the world. We see a video of a IDF sniper shooting a unarmed civilian and cheering about it when he falls dead. We see pictures of Israeli civilians watching and cheering the mass slaughter of unarmed Palestinians joining a peaceful march. We did know. We did witness. We, the European Trade Union Initiative for Justice in Palestine, demand that the EU condemns in the strongest possible terms the shooting of unarmed Palestinian civilians. We demand an end to the complicity of the EU, at an economic, scientific and technological research, and military level, with Israel ’s human rights abuse. 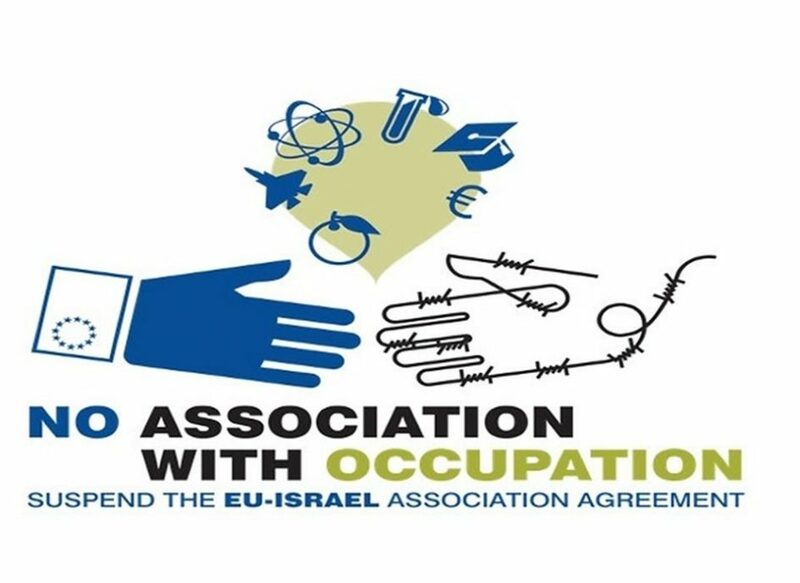 We demand the termination of the EU-Israel Association Agreement until Israel complies with UN resolutions and international law. As long as Israel refuses to do so, and we permit this trade agreement to continue, we are all complicit.